The man formerly hailed as the world's leading atheist philosopher has labelled Richard Dawkins a "secularist bigot" in a takedown of The God Delusion. Machine is a Toshiba Tecra A9, dual boot XP Pro and Vista Ultimate. At least, it was a dual boot until some pesky Microsoft update this afternoon apparently put the kybosh to this. So rang Microsoft UK, which auto-redirected me to the US which, on a keypad option, put me through to some operator in the Philippines. Who could not assist until the tech support team come online at 6am Pacific time (California). More on the legend of the Obamessiah. Classic. NZ's news media appear to have been blinded by advertising dollars over the CFL mercury issue. While Newstalk ZB runs an advertising campaign for the Government's "powersavers" campaign on its website and on air, it has failed to run one single story on the CFL dangers, or the Greens' call for an official inquiry. Nor has it been mentioned by any talkback caller, or host, that I can find. In contrast, Radio Live's Tim Giles and Bill Ralston have both covered the issue extensively, and the Herald on Sunday covered it too. I have just finished reading your latest issue of Investigate which I purchased for the article on CFL's. I manage a company that supplies just about all forms of light bulbs available in New Zealand including CFL's and I wish to say I have no argument at all with the article, in fact it enforces my personal view of these lamps. When ever I have been asked my opinion of these lamps I always point out there are no CFL's in my house and there never will be. I can stock pile as many lamps as I wish too. My staff and I have also always been very concerned about these lamps going to the tip at the end of there life and the mercury leeching into the soil and or water course throughout the country. Imagine 20years down the road with 4.5 million people dumping these things in there everyday rubbish. We do offer to our clients a recyling service for these lamps which sees them safely recycled with a zero waste policy. This process is run by Interwaste here in NZ with the lamps eventually ending up in Australia after having the mercury removed here first. What I would like is permission to copy/purchase this article (by email) so I can pass it to all interested parties. I have looked on your website and I can't find it for sale at the moment. Thank you again for a enlighting article. The following is the editorial from this month's Investigate. For the sake of bloggers, it sets out the political fallout potential from the special investigation in this month's magazine. In October next year, New Zealand and Australia will jointly become the first countries in the world to ban ordinary incandescent light bulbs. It appears to have been a bright idea dreamt up by bureaucrats in one of those non-descript trans-Tasman think tanks four or five years ago, and quickly seized upon by politicians on both sides of the ditch looking to make a name for themselves. In New Zealand's case, the clowns in question are Labour's David Parker and Green leader Jeanette Fitzsimons, but there's good reason to suspect Parker may only be a glove-puppet – the Tsarina to Heather Simpson's Rasputin. That conspiracy theory would be easy to dismiss, were it not for the incompetence bordering on criminal negligence surrounding the introduction of Compact Fluorescent Light (CFL) bulbs containing mercury. CFLs for domestic use first became widely available under this current Labour administration which, since 2005, has been trying to build a caring green image. So desperate was Labour that it hijacked the neutrality of the Ministry for the Environment and allowed Helen Clark's 2IC, Heather Simpson, to secretly draft MfE briefing papers. Thus, independent advice from the civil service was ditched so Labour could achieve its political goals directly through the Ministry. All this happened under David Parker's watch, and is chronicled in the book Absolute Power. Parker is not a complete idiot, which is why it is hard to believe that – left to his own devices and genuinely independent advice – he would not have eventually tumbled to the dangerous situation we're revealing in this month's issue. Because what we've uncovered is a public safety travesty that in any functioning democracy would result in ministerial heads on a plate. Here's why: CFL light bulbs have been well-canvassed in the media for years. We've all heard how they last ten times longer than a normal bulb, how they save power, and how they contain a tiny amount of mercury. 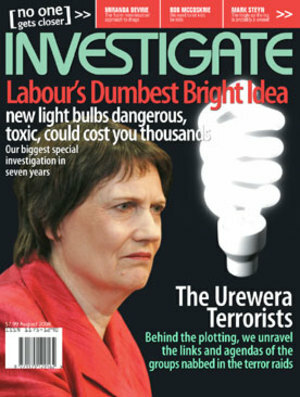 It's that last point that Parker, Fitzsimons, Labour Minister Trevor Mallard, Health Minister David Cunliffe and Consumer Affairs Minister Judith Tizard (and their predecessors in those portfolios) apparently had a collective brain dysfunction over – despite knowing that the bulbs contained mercury, no independent studies were commissioned to find out what happens if a bulb breaks in your home. Instead, the Labour/Green coalition were so focused on the political goal of looking decisive on climate change, that no one asked the glaringly obvious question: are these CFL bulbs safe for domestic use? It's a pity they didn't, because they now face the embarrassment that will be heaped on them over this magazine's latest investigation. Unlike New Zealand, when a lightbulb broke in the US state of Maine last year, government scientists there realized no one had ever done a study on the safety of these bulbs. So they did one themselves. They purchased 45 light bulbs for, I dunno, probably $250 tops. They sealed off a testing room for six months. And they spent those six months smashing their light bulbs, one by one, measuring the mercury given off. The result of their study is a 160 page report, released at the end of February this year. That report is turning the tables on previous glib assumptions about the safety of CFL bulbs. Now, you would think given the simplicity of the study, and the fact that NZ and Australia wanted to be the first in the world to ban ordinary light bulbs, that the Government could have directed ESR or one of the universities to do a similar study here. No. It didn't happen. So much for the knowledge-wave economy. Instead, for five years, the Government and its civil service advisors have simply taken at face value claims by CFL manufacturers that the mercury content is "negligible" and "does not pose a hazard". The US study shows those assurances weren't correct. The safety advice posted on NZ Government websites as we go to press is not only incorrect, it is dangerously so. There is enough mercury in one small CFL to deliver a dose of poison up to 300 times higher than the maximum allowable limit, and seven times higher than a limit where studies have shown damage to brain and cognitive function. Worse still, the Ministers failed to ensure the hazardous nature of the bulbs was recognized in the workplace, meaning shops, supermarkets, freight vehicles may all have been contaminated by mercury leaching from broken CFL bulbs. No instructions have been issued to transporters or retailers about the shipping, handling and storage of CFLs, or what to do if a box load breaks. For five years, members of the public and members of trade unions have been exposed to one of the world's deadliest neurotoxins in the workplace and in shops and homes, because Labour cabinet ministers looking for political brownie points relied on assurances instead of calling for independent tests. I got your magazine today and nearly cried. About a month ago a CFL broke in my kids room. Somehow it had fallen out of the light fitting and I found it broken on the floor - thankfully no one was in the room at the time. However I have 3 kids, one who is nearly 5 months and I don't know what to do now. Tomorrow I will contact my local council but don't expect much help. How do I get the room and house tested for mercury? Should I be chucking all the bedding, carpet, curtains clothes? Can it spread to other rooms (e.g. where the baby sleeps next door.) I am so cross we have been exposed to this. One of my children already has dyspraxia and I had been SOOO careful during this pregnancy - from being gluten free (yes it is linked to autism and other developmental disabilities), to doing all sorts of research and exercises to ensure I had a safer, birth (after 2 traumatic ones). Mercury has been linked to autism also, and as I work with a range of kids with developmental delays, intellectual disabilities and autistic spectrum disorders, I am even more aware of the consequences. I have tried hard to create a really healthy environment for my kids to grow up in...and now I discover they've been exposed to possibly toxic levels of mercury...and I VACCUMED it up (what an idiot)!!! Tonight my kids are sleeping in the spare room. Please flick me an email to give me guidelines on what I can do and who I can go to, to get the house tested. Thankyou for the article. Wish it had come out a month ago. Rachel revealed in a second email that her husband had broken a bulb in the kitchen recently and hadn't bothered mentioning it to her. Two CFL breakages in one home in the space of a couple of months. The Green Party has shifted from outright dismissal of allegations that CFL light bulbs are unsafe, to calling for an independent inquiry into the issue. “It is very difficult to assess the claims made, because the article confuses elemental mercury with methyl mercury: ambient air guidelines with single doses: and kilowatts with kilowatt hours. If Fitzsimons had read the Investigate story, and the references cited, she would have discovered that elemental mercury (emitted by the broken CFLs, metabolises into methylmercury in the human body and in the environment. She would also have discovered that scientists are seeking further information about the dangers of "single doses" from a broken bulb, although this has been overtaken by the discovery that a broken CFL bulb is the 'gift that keeps on giving', continuing to release dangerous doses of elemental mercury into household air for months even after the site has been cleared to existing Government standards. “It is also very hard to see the connection between a pin-head-sized solid of mercury amalgam and a vapour which is said to contaminate whole houses. The connection is freakishly obvious to people who read the story: The Greens have relied on a false claim: that mercury only exists in the bulbs in solid, amalgam form. It doesn't. It exists in vapour form which studies this year were the first in the world to confirm. Unless the "independent" expert chosen by the Government to address this is a goon, he or she will find the scientific studies quoted say exactly what we are reporting. Green Party leader Jeanette Fitzsimons has illustrated the dangers of shooting her mouth off without knowing the facts, by making an embarrassing statement that will come back to haunt the party. Green Party co-leader Jeanette Fitzsimons said the issues raised in the article were not new. She was aware of the case involving the woman in Maine and described it as "the most absurd thing I have ever read". Somebody was advised to take those precautions for one bulb, when it was probably a piece of solid mercury about the size of the ball in a ballpoint pen." She said household thermometers contained 100 to 600 times as much mercury as energy efficient bulbs. Fitzsimons clearly had not read the Investigate article, and the best spin you can put on her bogus comment is that the Herald journalist didn't brief her properly on the two new scientific studies that warn the mercury in a light bulb exists in vapour form, not just solid as previously thought, and that the bulbs should not be used in carpeted rooms or in areas frequented by children, infants, or pregnant women. When will the rest of the media start getting their facts straight in regard to Owen Glenn? National Business Review backs up the Absolute Power analysis, that Glenn barely has enough to rub two sticks together. ...attempts by this organisation have failed to turn up enough to even warrant him a place on our Rich List (you must have over $50m). Talk about a hollow man.